Life on board the Antarctic Dream . After the seasickness of the first two days had subsided, life on board the MV Antarctic Dream settled down into a routine. 09:00 - Land on an island (or the Antarctic mainland) by Zodiac*. 12:00 - Return to the Antarctic Dream, drink hot chocolate. 12:30 - Lunch (whilst the ship moves to a new location). 14:00 - Second landing by Zodiac. 17:00 - Return to the Antarctic Dream, drink more hot chocolate. 19:00 - Dinner, drink wine. 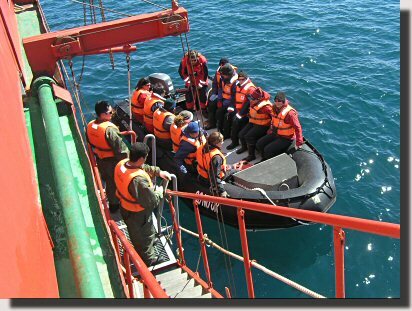 * Zodiac is the trade name of the most well known type of "rubber boat". 1) How not to pollute the Antarctic (based on the guidelines of the International Association of Antarctic Tour Operators). 2) How to get into and out of a Zodiac without falling in the sea (both very laudable aims). Food and Drink: The food on board was good and varied, with four courses at lunch and dinner (usually with a choice of dishes for two or three of the courses). Free wine, beer and other drinks were served with lunch and dinner (but not breakfast). Unfortunately the food was not always hot enough. Service was fast with a relaxed atmosphere. Tables were not assigned; people "mixed and matched" at will. The dining room windows provided spectacular views. Clothing: Before the start of the trip we were given conflicting information on clothing. We were first told that down jackets and warm boots were provided. Then we were told that we (as reduced price passengers) had to hire suitable clothing in Ushuaia. On approaching the recommended hire shop we were told that the clothes we were wearing were already suitable. The hire shop was right. What is required (on our boat at least) is wellington boots with thick socks, a wind proof jacket and trousers (that is pants for any USA readers), lots of warm layers, gloves and a warm hat. Standard European skiing gear is fine. The reason for the wellington boots is that you get out of the Zodiac into 30cm of water and then walk ashore (this avoids accidents with people trying to jump from the boat to dry land). You can then change into walking boots, though this is not necessary. Internet: Although the cruise brochure claims that Internet access is available on board, this is only technically true. The minimum unit of Internet access costs $120.00USA! For this you get only 20Mbits! No passenger used the Internet. Photographs: Many passengers had laptop computers with them to download photographs from their digital camera(s). The unused public "Internet" computer was available to transfer photographs from most formats of memory card to CD (bring your own blank CDs). Half way through the trip we had already taken about one thousand photographs. Warning: Penguins are photographically addictive! Languages: English was the main language used on board. All lectures, announcements and printed notes were in English and Spanish. Lectures: We had two lecturers on board, each giving three formal presentations. They also took part in all the shore excursions and answered questions. One lecturer covered Geology and the other biology (predominantly ornithology). The Bridge: The ship had an "open bridge" policy. Our captain was happy to show passengers around in English, Spanish, German, French or Swedish. TV: All(?) cabins had a flat screen TV. Each day four feature films were shown, starting every four hours with a fifth channel devoted to Antarctic travel documentaries. Ship Size: The guidelines of the International Association of Antarctic Tour Operators specifies that a maximum of 100 people may be landed at any one point in Antarctica at any one time. As a result it is best to choose a ship just below this number. If for example you are on a 400 berth ship, you will only be allowed ashore for a very short time. Overall we highly recommend the Antarctic Dream , at least in 2007. Home - This page last changed on 2007-01-08.